Caspar is a small village on the north coast of California. Caspar lies between Fort Bragg, and Mendocino. What was once a bustling town in 1955, is now a village supported by farms and ranches nearby, and by urbanites visiting their summer homes, anxious to savor the rugged beauty of the Mendocino coast. History: The first recorded settler was Siegfried Caspar, a man settling here from Germany to raise horses. Jacob Green Jackson was third to own the land. Already a fully functional sawmill built by the two men who sold him the land, William H. Kelley and a man simply named Randall, Jackson proceeded to boost the timber yield to 25,000 board feet per day. The mill in 1938: photo by Anthony Stewart from the 1939 National Geographic Society. The “big splash” is the result of a log hitting the mill pond after sliding down the chute. The lumbering era in Caspar Creek is significant. Spanning more than 90 years, from its beginning in 1864 to the closing of the mill in 1955, the Caspar Lumber Company was controlled by a single family, Jacob Green Jackson and family. It appears that the Caspar Lumber Company was able to survive where so many others failed because it was able to maintain an adequate timber supply, eventually owning the timber in what would become the Jackson State Forest. The Caspar Lumber Company was a rare entity on the redwood coast. Its life was exceptionally long. It was quick to adapt new methods, and was the first to begin steam railroad logging. The scale of the operation was large, as befitted the place that reduced the largest logs ever milled to lumber, often 12 feet in diameter. Many timber industry innovations were pioneered here, including redwood water main and sewer pipe, the double-sided band saw, and the wire chute with which finished lumber was delivered to the decks of the schooners. The town of Caspar, located on the headlands north of the mill, expanded with the mill. The first business at the town was a saloon, this was followed by a blacksmith shop, a shoe shop, and the Doyle store. A post office was established in June 1874. By 1880, an express and telegraph office, and electricity also appeared. The population of Caspar had reached about 500. In 1901 Jacob Green Jackson died and left the operation to his son-in-law, Henry Krebs who continued to expand on the company policies and the mill continued to operate until November 1955. Lumber was exhausted on Caspar Creek, the mill was shut down, and the remaining supply of logs was sold to the Union Lumber Company of Fort Bragg. Although there are no visible historical remains on the state beach, the public has ready access to the adjoining beach at the mouth of Caspar Creek, and people frequently wander about the ruins all through the harbor. Since the Caspar Lumber Company operated well into the twentieth century, there is ample evidence of the mill. With heroism and ingenuity, Caspar has always been about people first. By the standards of its day, Caspar’s lumber operations were extremely safe, humane, and considerate of the forest and surrounding area. The result is that the headlands today are a fascinating blend of history and nature, pride and nostalgia. Today: The population of Caspar today is only about 300 people. Caspar in addition to the residents of Caspar has the Caspar headlands State Reserve and State Beach. In addition there are 2 RV Parks and campgrounds. In the heart of Caspar there is the Caspar Community Center, an historical schoolhouse where they hold conferences, events, meetings and classes. And the famous Caspar Inn which is the areas local nightclub with there claim to fame as the oldest road house in Northern California. So the next time you are visiting the Mendocino coast take time and visit beautiful Caspar. 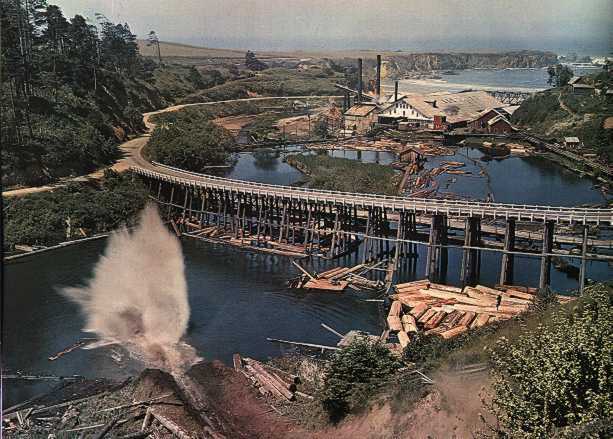 This entry was posted in Mendocino History and tagged caspar, Caspar Lumber Company, Mendocino.